Hello and welcome to another edition of Mastication Monologues! Today I present to you Taj Palace in Itaewon located at 39, Usadan-ro, Yongsan-gu, Seoul 서울특별시 용산구 우사단로 39 (이태원동). Directions: Get off at Itaewon Station (Subway Line 6), exit through Exit 3. Walk 5 minutes and enter the alley next to the fire station past Kookmin Bank. The restaurant is located down the street. Now, I’ve had my fair share of Indian food throughout my life due to the high population of Southern Asians in the Chicagoland area, but this meal contained probably some of the best Indian food I’ve ever had. 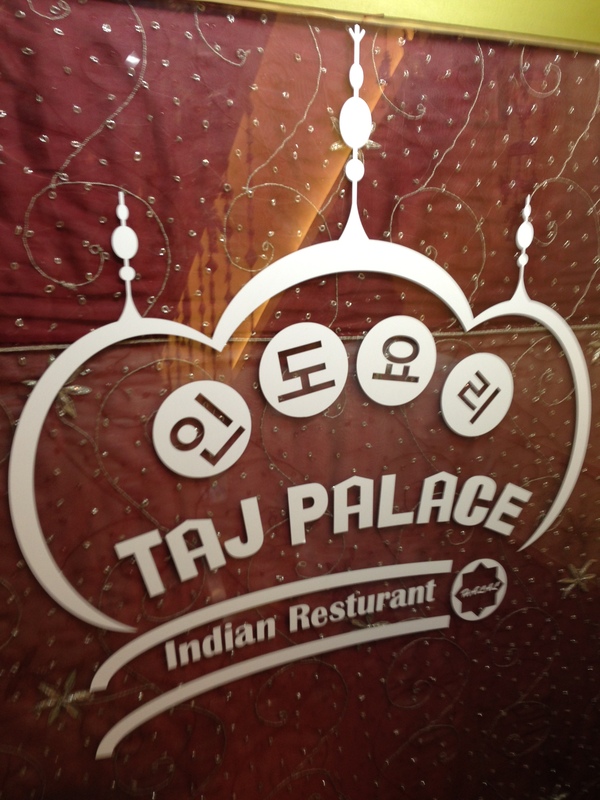 A bunch of friends and I made our way to Taj Palace in Itaewon for our friend Steve’s birthday, and I was a bit wary of this experience since the last time we went out for someone’s birthday in Itaewon, it ended quite badly in terms of the food (See Saved By The Bell). The restaurant’s staircase was decorated with beaded strings , and then the actual dining room was tastefully decorated with paintings and pictures of various parts of Indian culture. We were seated immediately, and I saw that they had a sumptuous banquet laid out against the back wall. I had only eaten a bowl of cereal the entire day, so I was ready to explore what sort of Desi delights Taj Palace had to offer in their buffet for 18,000 Won. 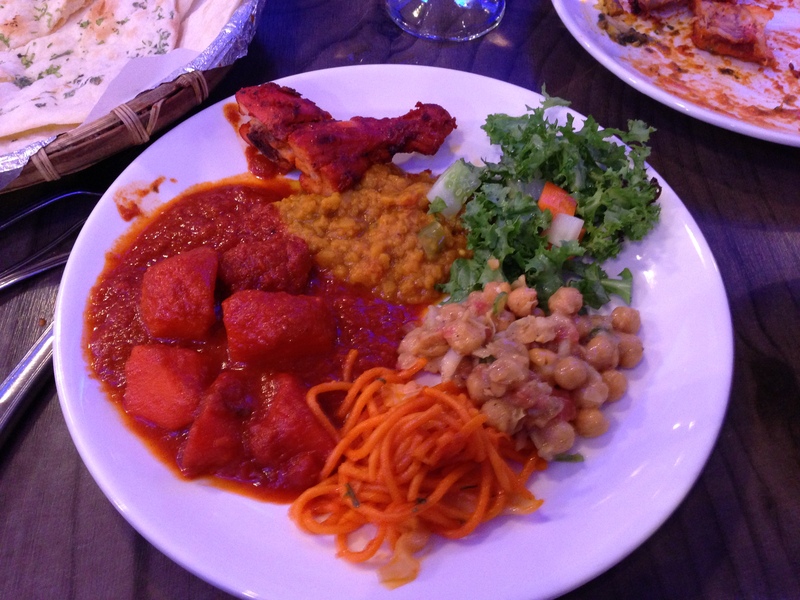 I started with the standard Tandoori chicken that can be found on any Indian restaurant’s menu. This chicken dish is named after the type of oven it is prepared in, a tandoor, and is first marinated in yogurt before being grilled. Then the chunks are coated in spices like paprika which give the meat its brick red hue. These mighty pieces of meat were excellent in terms of size, juiciness, and spice level with just the right amount of paprika to test your heat tolerance. Then there were the oddly named aloo beans. I say oddly because aloo is the Hindi term for “potato”, but it didn’t seem like there was a single potato in the dish. The sauce seemed to be similar to aloo gobi since I could taste hints of savory turmeric, and the green beans were perfectly cooked. After plowing through that bit, I made my way to the butter chicken. What it is is pieces of boneless chicken roasted in a tandoor and then plopped into a gravy that consists of tomato puree, butter, and spices like turmeric and cardamom. It was more of a dish for people with less of a spice tolerance, but still had plenty of great flavors where the tomato puree possessed occasional hints of garlic and some weak chili elements. I switched gears going from one chicken dish to another as I tasted saag chicken for the first time. It comprised boneless pieces of chicken sauteed with spinach and spices. 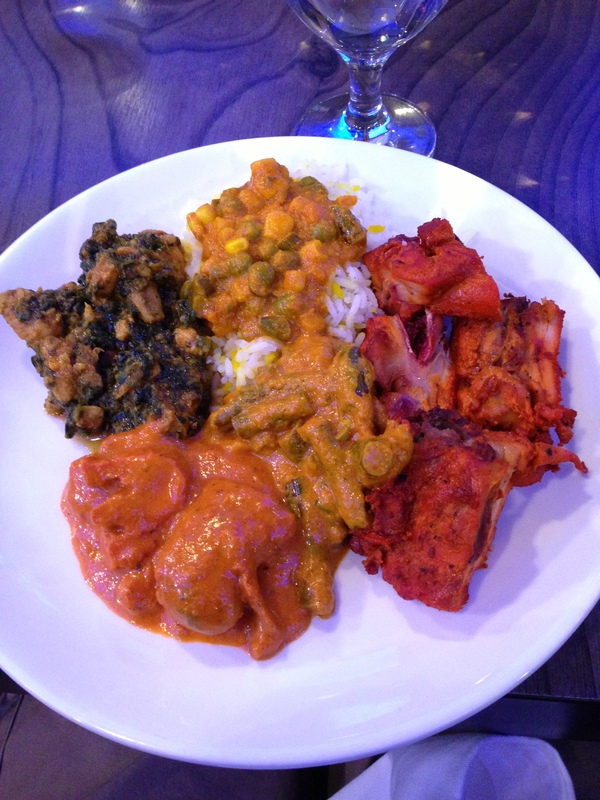 I’d probably say this was my second favorite dish out of the entire buffet because I love spinach to begin with, and the addition of the high quality meat along with the garam masala made it really stand out. The last part of my first plate was my vegetarian curry piled high on my saffron rice. It was somewhat pedestrian compared to the other samplings on my plate, but with the perfectly prepared white and yellow rice, it really brought my first mini-meal to a respectable end. Then there was my second plate. Clockwise: green salad, chickpea salad, Kadhai noodles, lamb vindaloo, and dal hariyali. On my second plate and for the whole meal, my favorite was the lamb vindaloo. It was respectably spicy, but the only downside was the lack of lamb pieces swimming about in the devilishly red sauce. The green salad was pedestrian compared to the other food since it didn’t possess any of the aforementioned mind and mouth boggling flavors and spices. The lettuce, carrots, and cucumbers were fresh and verdant though. I really liked the chickpea salad too because these small legumes are a great source of protein, had a creamy texture, and were mixed with a garlic vinaigrette that really made the flavors pop. The kadhai noodles and the dal hariyali were nothing special, especially the former. I thought they kind of didn’t fit in with the rest of the foods in terms of flavor, and the noodles didn’t taste like anything. As for the dal hariyali, it was a vegetarian dish consisting of red lentils, coriander, spinach, and methi leaves. While it possessed the same creamy texture as the chickpeas, it was on the blander side of things. I was surprised that the coriander and methi leaves didn’t bring stronger herbal flavors to the taste spectrum. 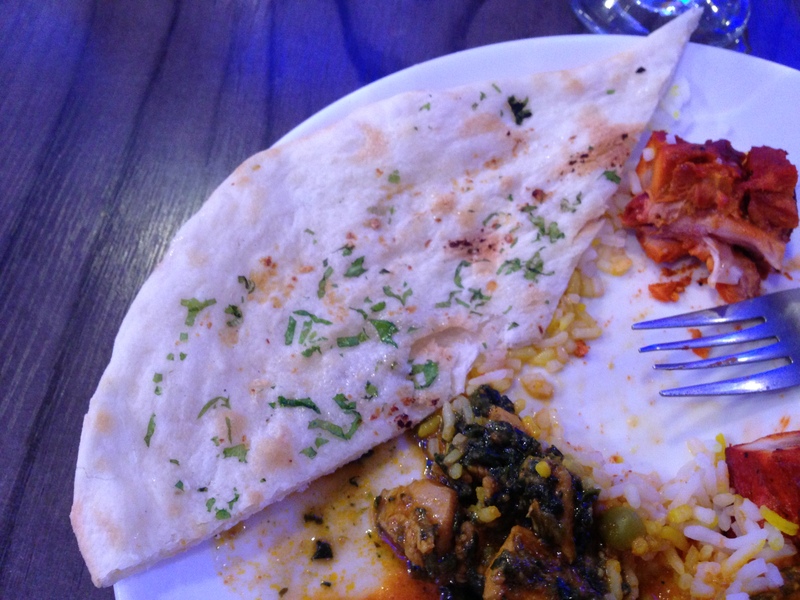 While I was eating all of these delicious plates, they provided us with complimentary naan which is basically flatbread that can be prepared in a number of different ways. This naan wasn’t the best I’ve ever had, but it was soft, fresh out of the oven, and garnished with coriander. 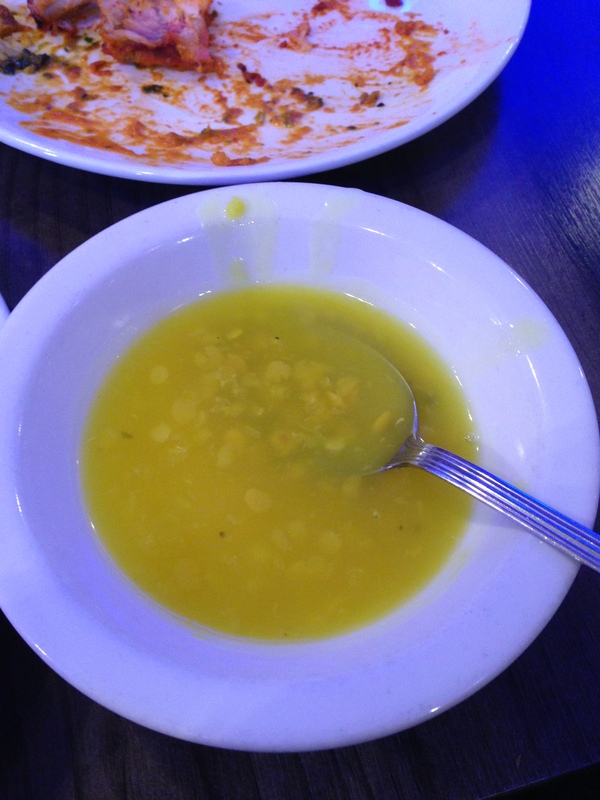 I also tried their dal soup which consisted of yellow lentils, but I was indifferent to it. It just tasted like beans. However, the dessert was quite interesting. We were all trying to figure out what to compare it to which ranged all the way from porridge to semolina, but the actual name of it is kheer. These parallels to other foods were drawn due to the fact that it is made of boiled rice with milk and sugar, so there was a slight grainy texture to each thin, vanilla-tinged spoonful. Plus, it was garnished with raisins and almonds which took this dessert to the next level in regard to texture. It wasn’t mind blowing in terms of flavor, but this pudding was a pleasant surprise since it initially didn’t look like the most appetizing after-meal treat in the world. 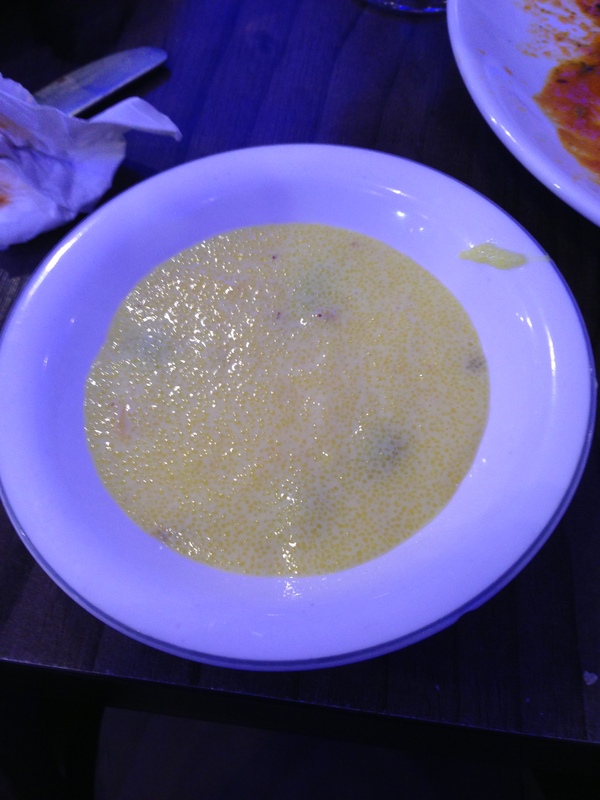 By the time I slurped up the last drops of kheer, I was thoroughly stuffed and satisfied. 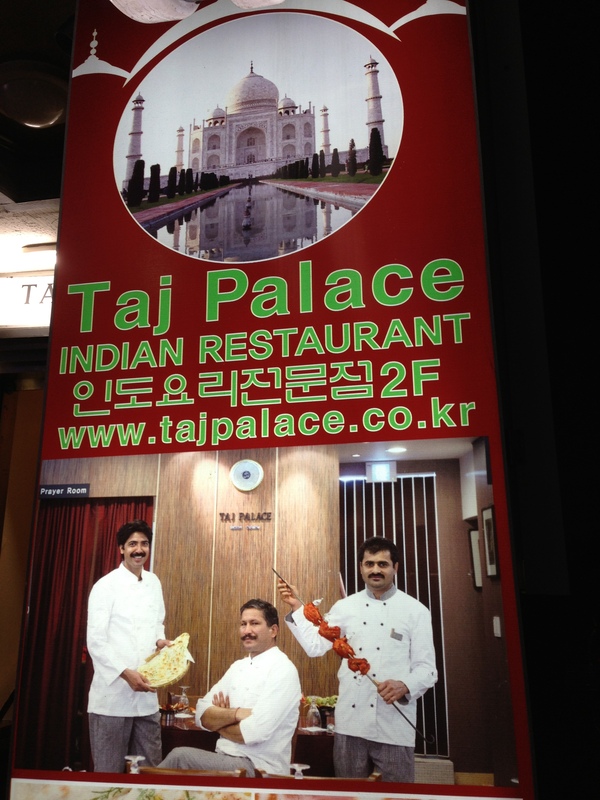 If you’re looking for great Indian food in Korea and don’t know where to turn, visit Taj Palace. 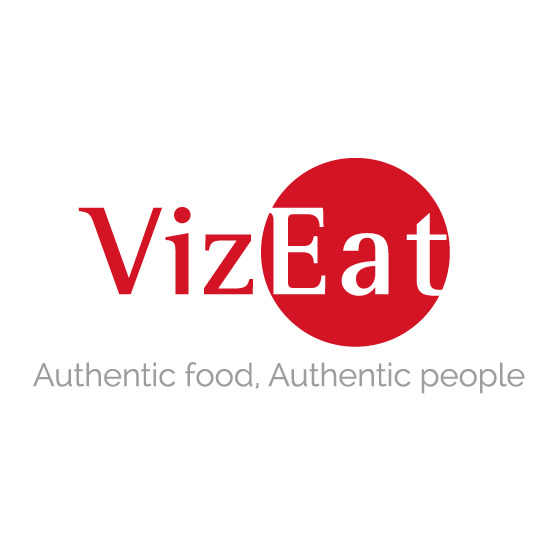 It has it all: quality food, generous portions, and a great ambiance.